Want to write for PBR? Introducing Golden Age with Ryan Veal. This inaugural episode touches on offseason moves for the Nashville Predators, news and predictions. Golden Age on Twitter and Instagram @PredsGoldenAge. Justin is the author of "The Making of Smashville." An award-winning reporter, in 2013, he received the Silver Medal in the Best Sports Reporter Category for The Tennessean's Toast of Music City reader's poll. In 2014 & 2015, Justin was voted as the Best Sports Reporter in Nashville. In 2014, PenaltyBoxRadio.com received the silver medal as Best Blog in Nashville. In 2015, the website received the award for Best Sports Blog in Music City. In 2016, the site was awarded 2nd place as Best Blog in Nashville. 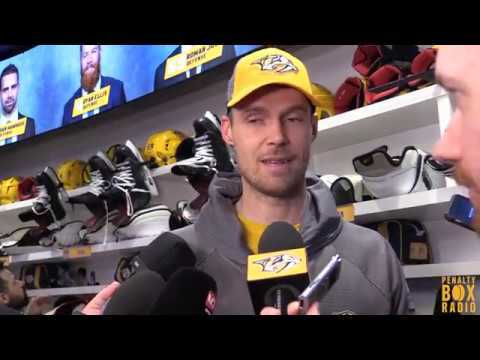 He has been a featured guest on "NHL Tonight" on NHL Network, "Inside Sports Sunday on WSMV-TV, "All Things Considered" on NPR, "Road to the Cup" on WKRN-TV, "Sportsline" on NewsC hannel 5+, "Predators Playoffs Today" on ESPN 102.5 The Game, TSN 1290 Winnipeg, Sportsnet 590 The Fan - Toronto, TSN 1260 Edmonton, WGR Sports Radio 550 - Buffalo, and featured in The Ringer, Saturday Down South and The Tennessean. Credentialed by the Nashville Predators, the NHL (Stanley Cup Final, Draft, All Star Game), WCHA and CHL.